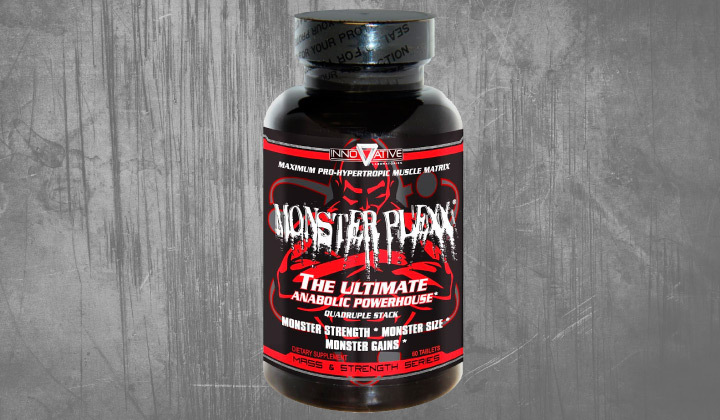 Monster Plexx by Innovative Labs – Exclusive 5-in-1 Probolic Supplement ! Are you ready to achieve more lean muscle gains, increase your mass, and enhance your strength the way you’ve never done before? Innovative Labs Monster Plexx is exclusive 5-in-1 probolic supplement currently available on the market which can ensure results you want to achieve and could only see in bodybuilding magazines until now. This supplement will greatly increase probolic and androgenic effects. Innovative Labs presents one of the few legal prohormone complexes which is truly able to ensure effective strength and muscle size gains you want to achieve. Where to buy Monster Plexx ? What is Innovative Labs Monster Plexx about? Innovative Labs has combined esters and all the other compounds in Monster Plexx, and that makes this supplement different from other prohormone and andro supplements currently available on the market. How does it benefit your body? The supplement ensures the constant release of its ingredients into your bloodstream, and your hormone and testosterone levels are constantly kept high. You don’t have to worry about correct doses taken at an exact time anymore. You no longer have to take a dose many times a day. Consuming the supplement, you make body release constantly elevated hormone levels, ensuring their multiple peaks during the day. The Monster Plexx supplement is a unique combination of powerful prohormones and plant extracts. First of all, it’s the Anabolic and Prohormone Blend. 1-Andro, EpiAndro, and 4-Andro are included here. The 1-Andro compound is a DHEA derivative which undergoes a certain conversion process. It converts from 1-Andro to 1-AD and then to 1-Testosterone, a compound which is 7 times more powerful than natural testosterone. At the same time, the compounds will never convert to estrogen. The EpiAndro compound or Epiandrosterone is one more DHEA derivative included in the formula. It is taken naturally from in pine pollen! The compound boosts the body DHT levels, and that helps bodybuilders to improve their sexual experience and strength. In addition, it helps athletes to gain extra muscle mass and to lose body fat. The 4-Andro compound otherwise called as 4-Androsterone or 4-DHEA is a DHEA derivative too. In your body, it converts to testosterone, so, you will experience muscle mass and strength gains right away. As the compound promotes extra testosterone release, your body will improve protein synthesis processes. 4-Andro may eventually convert to estrogen. So, while taking this supplement, you have to take some estrogen blocker as well! Another blend, included in the supplement formula, is the Plant Androgenic and Anabolic combination. This blend includes Diosterol, a powerful compound which stimulates the LH hormone or Luteinizing Hormone release. In its turn, it instructs your body to increase its testosterone production. The supplement also includes Ajuga Turkestanica Extract, the plant species which is found in Uzbekistan. The extract has good anti-inflammatory properties. This feature promotes muscle recovery processes and helps maintain muscle gains! It’s recommended to take 1 capsule in the morning and another capsule in 6 to 8 hours. You may take this supplement with or without food. We advise you to take this supplement in the course of 4 to 6 weeks. After that, make at least 8-week break prior to starting your new cycle. We recommend “Advanced Cycle Support – Iron Mag Labs” and “Arimistane (Arimiplex) by Hi-Tech”. You might be interested in: Abnormal by Blackstone Labs – Only Your Way!